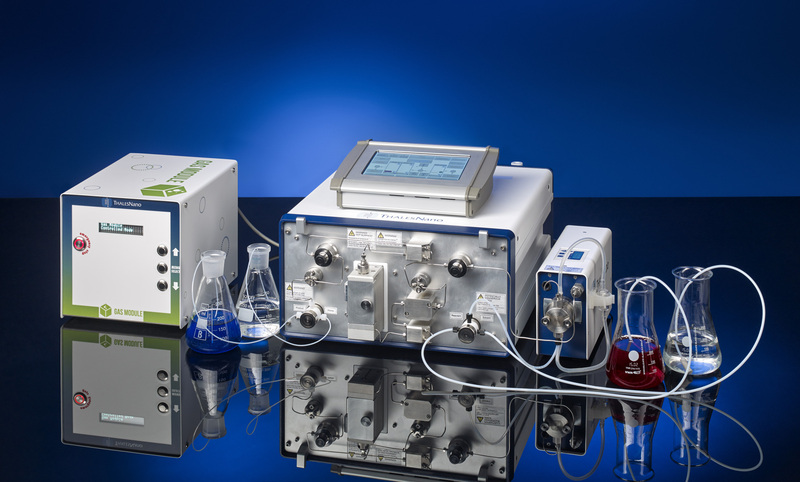 ThalesNano’s H-Cube Pro system in connection with a Gas Module is a versatile tool to manage different type of carbonylation reactions up to 100 bar. Either carbon monoxide or synthesis gas can be controlled by the Gas Module with excellent accuracy, which guarantees the safe operation of the systems. Carbon monoxide is an industrial gas that has many applications in bulk chemicals manufacturing. Carbonylation refers to reactions that introduce carbon monoxide into organic and inorganic substrates. Several industrially useful organic chemicals are prepared by carbonylations, which can be highly selective reactions. Carbonylations produce organic carbonyls, i.e., compounds that contain the C=O functional group such as aldehydes, carboxylic acids and esters. The reaction, at one level, represents one of the largest scale precious metal catalyzed homogeneous processes (hydroformylation). At a much smaller scale it provides researchers with a very adaptable route into products like carboxylic acids and esters, aryl aldehydes and amides. Discovered in 1938, hydroformylation is the most important example of the industrial application of homogeneous catalysis. Production is now well beyond 10 million metric tons annually. Propene-based products still account for two-thirds of this volume. Highly selective processes using ligand-modified rhodium catalysts have been developed and are state of the art. In situ NMR and IR under reaction conditions and molecular modeling are modern tools for gaining insight into the intricate mechanism, but the reaction is still far from being understood. From the viewpoint of engineers, the crucial problem of homogeneous catalysis, recycling the generally expensive catalysts, has not been satisfactorily solved. As a consequence, old but robust high pressure processes are witnessing a revival. After 60 years, hydroformylation is just beginning to be a general tool for chemists and new frontiers and challenges have to be met. Alkoxycarbonylation uses water or alcohols as nucleophiles to form carboxylic acids or esters. The limited interaction of alcohol/alkoxide with the palladium catalyst makes this the most robust of this group of reactions and this is reflected in a significant number of industrial applications. Aminocarbonylation uses ammonia or amines to form amides and can be carried out using similar conditions to the alkoxycarbonylation, although excess amine acts as an inhibitor of the reaction. The flow technology with immobilized catalysts provides a safe and efficient solution to manage carbonylation reactions, without the problem of the catalyst separation from the reaction mixture.